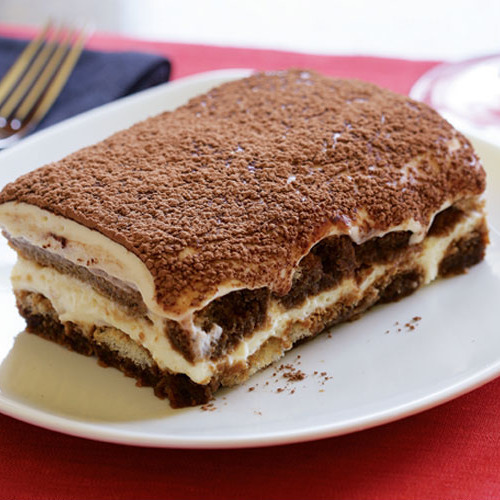 Tiramisù has gone through countless reinterpretations by chefs and cookbook authors—some of which are hardly reminiscent of the original. 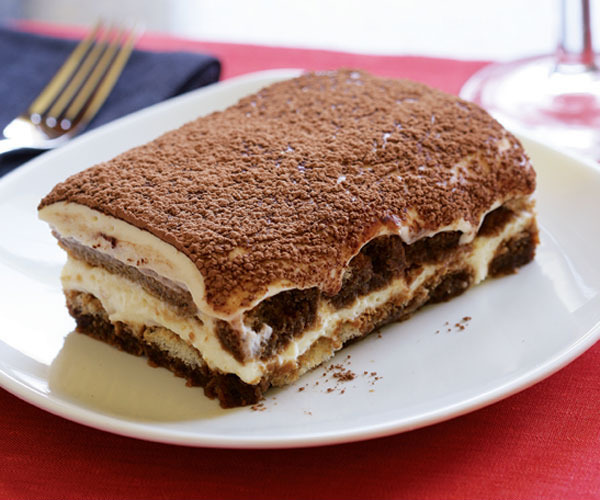 So let’s set the record straight: Authentic tiramisù as I know it is made with flaky, cookie-like ladyfingers briefly soaked in espresso and layered with a silky smooth mascarpone cream. My mother makes a delicious one with a soft, fluffy texture and a lip-smacking bittersweet kick that’s hard to beat. 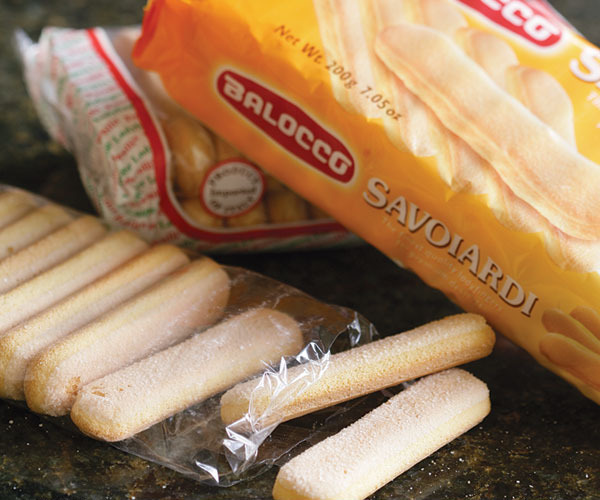 And because it calls for packaged ladyfingers (like most Italian tiramisùs), it’s simple and relatively speedy to make. After hunting far and wide for a tiramisù as good as hers, I finally gave up and phoned Mom for the recipe. With tiramisù’s high-energy mix of sugar, eggs, and caffeine-rich espresso coffee, it’s no wonder it means “pick-me-up.” And indeed great tiramisù starts with really good espresso—a lot of it. The stronger and better tasting your coffee is, the better your tiramisù will be. My mother and I make coffee in a stovetop espresso pot, called a “caffettiera moka” in Italy. Of course, if you have a coffee shopstyle espresso machine, go ahead and use it—although it may take a while to collect 5 cups of coffee, shot after shot! 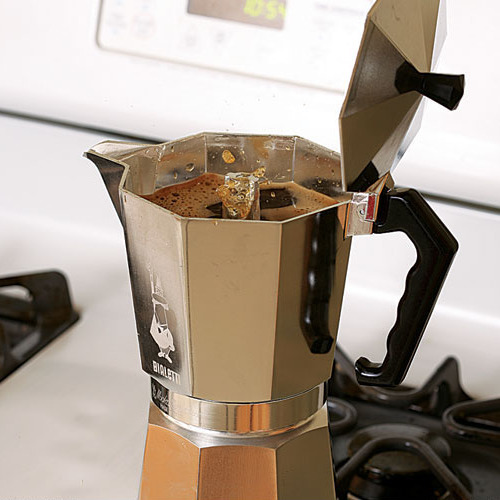 If you don’t have an espresso machine, use a drip coffee maker and brew double-strength coffee using espresso roast. If you can’t find espresso roast, the Italian brands of ground coffee that you find in grocery stores, such as Illy or Lavazza, work fine. Although it may be tempting, stay away from instant espresso powder. Reconstituted, it has no body and, with its unpleasant burnt-wood tang, it hardly tastes like espresso. The trickiest thing when making tiramisù is knowing how long to soak the ladyfingers in coffee. Usually it’s only a few seconds, but there is so much textural variation from brand to brand that it’s impossible to give a surefire soaking time. My mother always uses the same brand, so she knows exactly when to take her ladyfingers out of the coffee before they get too soggy. And you’ll know too, after you get acquainted with a brand of ladyfingers you like. Laura Giannatempo uses a stovetop espresso pot to make a large batchh of espresso for tiramisù. What will make or break your tiramisù is texture: The ladyfingers have to be just barely soaked through with coffee, moist but not soggy and falling apart. When testing the recipe, we found that brand and type of ladyfinger make a big difference. You’ll find two main types in grocery stores: packaged, cookie-style ladyfingers (usually imported from Italy) and soft, spongy ladyfingers commonly sold in clear packages in the bakery section of most supermarkets. In my experience, the latter won’t do the trick. They get too soggy too fast, resulting in a sopping mess. Use the cookie-style ladyfingers instead.